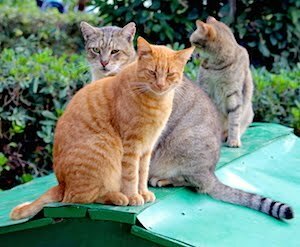 Visitors to the Maltese Islands will soon notice the well fed and healthy feral cats in the parks and streets... Wait a minute, stray cats and good looking? ...Well, in our small nation in the heart of the Mediterranean Sea, a total of approximately 1'000 individuals take care of -a conservative estimation of- 100'000 feral and abandoned cats. That's how. Our photo-story book «Islands of Cats» highlights twenty of these men and women from all walks of life, whose vital work keeps the cats in top condition by feeding them in steady colony locations, taking them to the vet, and, most importantly, by having them neutered and spayed to control the furry population. Notably covering all costs out of their own pockets. Therefore, some of the proceeds of every book sold will be donated to the stray cat carers. But first we have to fund the costs for translations to Maltese and German, and for printing the first 1'000 hardcovers to have «Islands of Cats» ready for release in May 2016. Help us to help the stray cat carers. Please take a few minutes to review our project presentation on Kickstarter, where our crowdfunding campaign will end on March 9, 2016. Pledge an amount today while your credit card will only be charged on March 10, and if the funding goal has been reached. Alternatively, your direct contribution via Bank Transfer or PayPal is also welcome. Spread our call for funding by forwarding this email to your friends and colleagues, and like and follow us in the social media. Thank you so much for your time and consideration, and stay tuned for more. Read more about how you can contribute in the full newsletter. Click here for all recent newsletters.